There are many Federal, Regional, State, and local programs available to assist Jaffrey businesses. The Jaffrey Economic Development Department is always available to help any business identify, apply for, and utilize these resources. Call, email, or stop by for more information. The Jaffrey Revolving Loan Fund provides financial assistance to small and emerging businesses in cooperation with other lenders. Call Jo Anne Carr at 532-7445 for further details. Monadnock Business Ventures (MBV) is one of 15 Regional Economic Development Corporations. Corporations located inNew Hampshire. Services include business consulting, grant and loan assistance, and the operation of an 'incubator' facility for business start-ups. The NH Community Loan Fund’s business financing connects business owners with the capital and expertise they need to compete in a changing marketplace. The NH Small Business Development Center offers free, one-on-one, confidential business counseling, low-cost training programs, and access to information and referral. Specialized services include environmental counseling, manufacturing assistance, international trade programs, and innovative economic development initiatives. The NH Business Finance Authority (BFA) offers several loan guarantee programs for SBA eligible companies whose financing needs exceed the SBA's capacity. The BFA also issues tax-exempt Industrial Development Revenue Bonds for fixed asset expansion projects. NH Works provides employee recruitment services, training resources, and information on employment and labor laws, hiring incentives, disability resources and other services and benefits. Monadnock Economic Development Corporation is one of 15 Regional Economic Development Corporations located inNew Hampshire. Services include business consulting and grant/loan assistance. Granite State Development Corporation is a Certified Development Company operating inNew Hampshire.GraniteState is a private, not-for-profit company which was established to administer the SBA 504 Loan Program throughout the state ofNew Hampshire. The SBA 504 Loan Program enables small businesses to acquire long-term subordinated debt at below market rates. By working together with local banks,GraniteState has become the largest CDC inNew England. The Small Business Administration (SBA) is a Federal agency that provides technical and financial assistance to businesses throughout the country. The most common form of financial assistance is the guaranteeing of loans through private institutions. The link above is for the New Hampshire District Office. The NH Manufacturing Extension Partnership works with companies to integrate systems and technologies to create high-performance enterprises. Solutions for companies include business planning, lean enterprise, eBusiness, international development, technology transfer/commercialization and workforce development. The SCORE Association is a national, nonprofit association dedicated to entrepreneur education and the formation, growth and success of small business nationwide. SCORE is a resource partner with the Small Business Administration (SBA). SCORE Association's 11,500 volunteers serve as 'Counselors toAmerica's Small Business.' Working and retired executives and business owners donate their time and expertise as volunteer business counselors providing confidential counseling and mentoring. The NH Division of Economic Development – which includes its subagencies, the NH Business Resource Center (BRC) and the International Trade Resource Center (ITRC) – acts as a single point of contact for businesses at all stages in their growth cycle. BRC provides assistance in a broad spectrum of areas ranging from licensing and financing to permitting and workforce training. The New England Trade Adjustment Assistance Center is a government-funded nonprofit organization that offers cost-shared assistance to import-impacted manufacturers through a grant from the U.S. Department of Commerce. Its goal is to helpNew England manufacturers increase profitability and retain employees while competing against imported products. 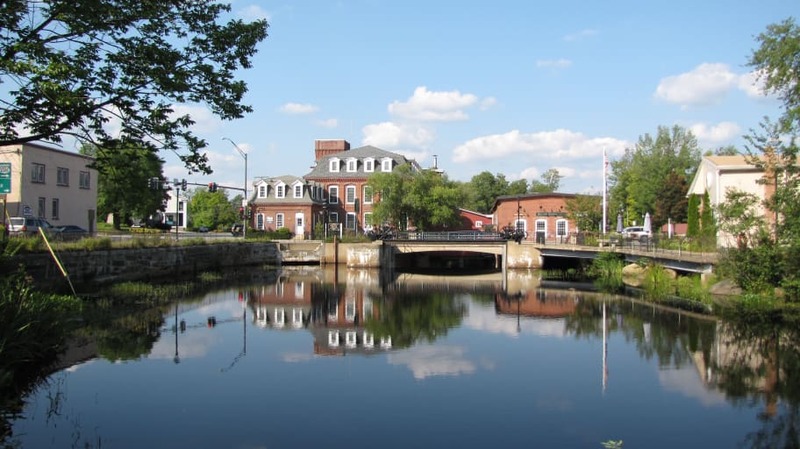 The NH Community Development Finance Authority (CDFA) provides financial and technical assistance to community development corporations, worker cooperatives, and certain municipal entities. CDFA does not assist for-profit businesses directly, but can work with a nonprofit partner. Assistance is most commonly accomplished through the granting of state tax credits.